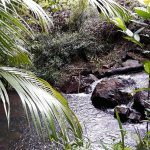 Daintree Rainforest gets highest rainfall in years… and loving it! Recent heavy rainfall in the Daintree Rainforest of Far North Queensland is just another part of normal life in the wet tropics. Although the Daintree River had the highest flood levels recorded in 118 years, the forest itself enjoyed every inch of the rain. Average annual rainfall for the Daintree Coast is 7 meters, but these massive volumes of water drain away quickly down the mountain sides, into the creeks and out to sea to cool down the ocean temperature. The high rainfall in this region is tied closely to the ecosystem of ocean and reef and rain forest. Wet Season! What wet Season? Surprisingly soon after the torrential rains dissipates, everything in the forest returns to normal. The clouds thin out, the sun beats down, a warm breeze drifts through the trees and the forest flourishes and glistens. This is when the world’s oldest living rainforest really comes alive and it is a great time to visit. So, lets see how to make the most of your summer in the wet tropics. There’s nothing more reviving than a dip in one of the shady Daintree streams which flow clear and cool on these hot and steamy days. 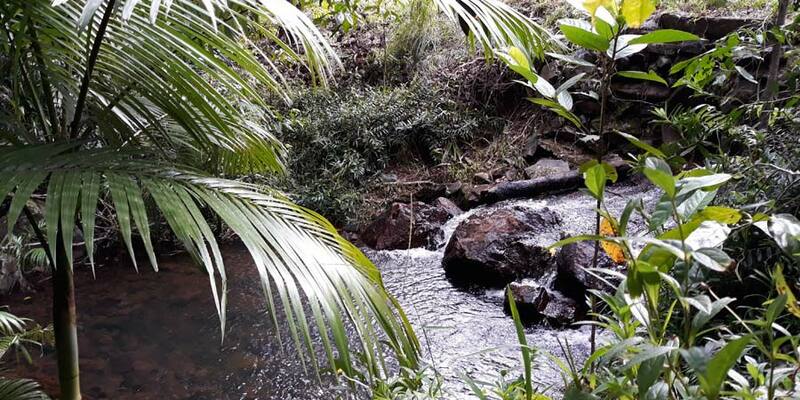 You will find little waterfalls and deep pools hosting rainforest fish and dragon flies. Hutchison Creek at Diwan has a beautiful deep swimming hole with sunny, pebbled banks and a babbling rocky stream. Or you can walk the short bush trail at Emmagen Creek which is just 4km north of Cape Tribulation. Emmagen Creek flows deeper and faster than Hutchies at this time of year and you have a choice of three natural swimming holes on the upstream side of the road. Emmagen Creek marks the beginning of the famous Bloomfield Track for 4WDs on the way to Cooktown. Often after heavy rain the Bloomfield Track will be closed until the water level subsides. Summer in the rainforest brings harvest time too. Exotic tropical fruits are all coming into season. 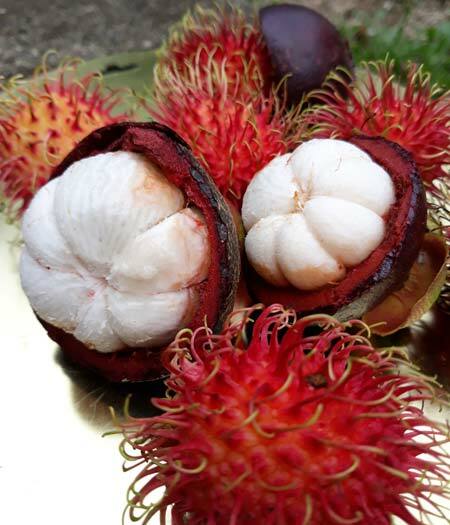 Right now, you can taste the locally grown Mangosteen, Rambutan, Abiu, Passionfruit, Paw Paw, Bananas, Limes and Lemonade Fruit, Jackfruit, Soursop and Star Apples. 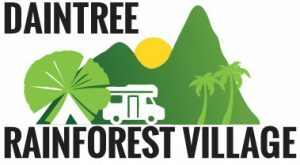 Our beautiful caravan park and camp ground at Daintree Rainforest Village is in lush tropical gardens and lawns right within the heart of this World Heritage listed National Park. The campground is set away from the road, behind our onsite convenience store and fuel station at 2094 Cape Tribulation Road, Diwan. We have delicious hot showers and a good clothes dryer in the coin operated laundry. Our friendly local staff can help you book the wet season adventure tours of Jungle Surfing, Ocean Safari, Coopers Creek Wilderness Walking Tours and Cape Tribulation Wilderness Cruise. We can give you plenty more tips to enjoy the rainforest boardwalks, beach walks, cafes and restaurants. We have a limited number of sheltered camps sites for those intrepid travelers who want to experience a real wet season first hand and keep their tents dry during a downpour. Each sheltered site has a metal framed roof with a large tarpaulin over a concrete pad and space to park your camper or motor home all under cover, with power and water connected. You simply drive in and set up comfortably under the shelter. When the rain clears you have beautiful mountain and rainforest views too. Very few travelers can say they’ve sat through a Daintree Downpour. You will be blown away by the sheer volumes of water that falls from the sky! If you are lucky a rainforest thunderstorm will come bouncing through the valleys creating an exciting, Jurassic mood. The wild calls of tropical birds, the songs of giant frogs and the click, click, click of geckos in their glory mix together with the drumming, humming rainfall. 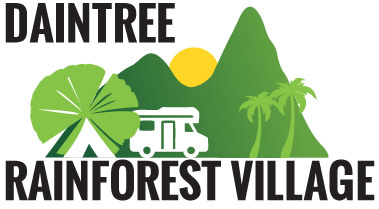 Daintree Rainforest Village is open for business 7 days a week during the wet season and all year round. Fuel, gas, ice and bait and handy pharmaceutical lines…. ATM, postal service and public phone, sweet treats, ice cold drinks and hot Aussie pies and ice creams. We have the largest range of groceries in the forest where you can get all your supplies for a great holiday any time of year. Come and experience the Daintree Rainforest at its finest. Wet season typically runs from December to March/April. Bookings for sheltered sites are essential. © 2019 Daintree Rainforest Village. All Rights Reserved.